Betsy Cross wanted a hot tub. Her husband, Will Cervarich, did not. The compromise turned out to be a good decision. 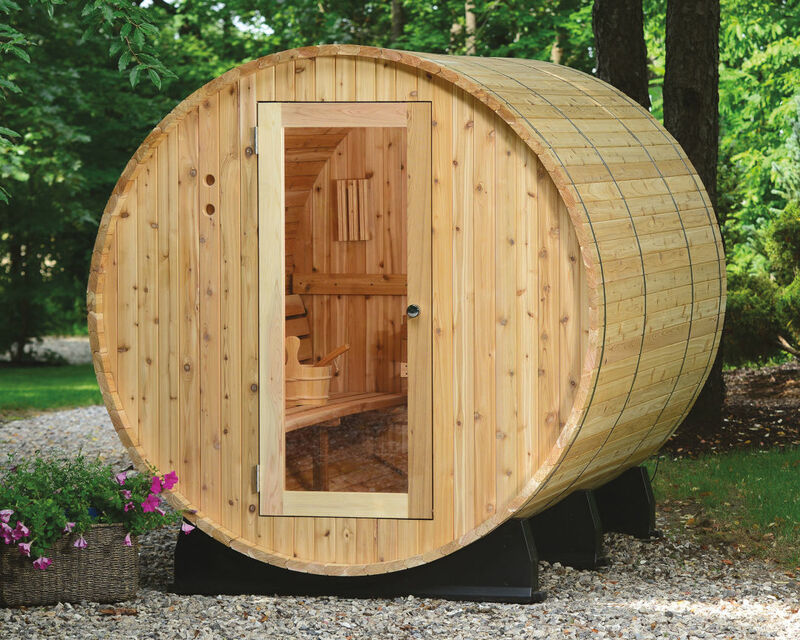 A while back, the duo, by day owners of local boutique Betsy & Iya, splurged on a DIY outdoor sauna from Michigan-based Almost Heaven. (Brands like Cedarbrook and SaunaFin make similar products.) The company ships all the necessary pieces to your door, leaving you to assemble the barrel like Ikea furniture. Instant sauna? More or less. Compared to, say, a basement sauna, it’s easier to install and doesn’t take up any space in your house. Sound invigorating? Here’s how to get started on your own. Build the barrel. Unless you want it to roll away (new idea: mobile sauna!) the sauna will need a hard, level surface. Cervarich built a brick platform. Installation of the sauna itself is not complex but is somewhat labor intensive. (“Their brochure is like, ’You and a friend can set it up in one to two hours,” says Cervarich. “It was more like four to six.”) The two end caps of the barrel arrive assembled and sit upright opposite from each other. Build the horizontal slats around them until you complete the cylinder. Two metal bands wrap around the barrel and are tightened to keep the shape. Add the heater (powered, in this case, by a cable the couple had an electrician run from the house) and benches inside, and voilà! Add a roof. The wood of the sauna is not, er, static. It expands and contracts with the the seasons and as it gets wet or dries out. When it rains during the warmer months, Cervarich says the wood can shrink to the point where you get drips inside the sauna. He recommends building a roof over it to avoid this problem, and also help protect it from the elements. Maintain it ... or not. Cervarich says beyond regularly wiping down and vacuuming the inside—the walk through the yard brings in some dirt and dead bugs—there isn’t too much maintenance involved. However, if you’re concerned about keeping the long-term appearance fresh, sealing the exterior wood and regularly oiling it, as you would a cutting board, wouldn’t be a bad idea.